Was there any different taste at all? Texture to the cooked and cooled meat? There wasn't any difference at all - i couldn't tell it from "unexpired" corned beef. Mmmm, corned beef. I'm going to breakfast this weekend with my SIL that makes its own homemade corned-beef hash. Delicious. The fact that it's clearly purple didn't give you any pause? 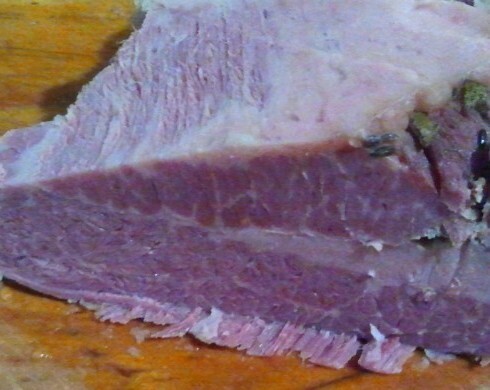 I've never seen corned beef come up that shade of PURPLE though. I think the purple color is the fault of the crappy lighting in my kitchen when I took the picture. 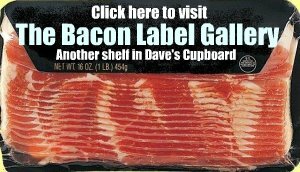 It was the same color as any other commercial corned beef. I sorta figured that out. Either the light or some other colour shift. I went to the local truck-em-up restaurant last night for their regular Wednesday special of corned beef w/boiled tatties and carrots - hold the (really nasty over-cooked to death) cabbage. Way more than I should be eating that late - but, slathered with some potent hoss raditch, butter on the tatties and S&P over all - it was right tasty. Especially preceeded by a bowl of chicken dumpling soup. Those Greeks who run the place do some awesome chicken soups -- but, strangely no avgolemono soup.